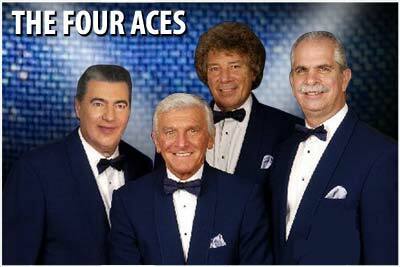 With their roots in Philadelphia, The Four Aces first began performing in 1949 and scored with their first hit "It's No Sin" in 1952. They went on to make numerous recordings with over Forty of their songs reaching the pop charts during the 1950's and 1960's. During the 1950's they developed into superb showman and went on to delight audiences of all ages, performing their timeless hit songs around the world. They appeared on numerous television specials and some of their hit songs were featured in several movies. Most recently The four Aces have appeared in two highly successful PBS specials entitled "Magic Moments" and "Moments to Remember". Currently The Four Aces feature lead singer Fred Diodati, who joined the group in the mid 1950's. They continue totravel the globe performing their timeless hits such as "Love Is A Many Splendored Thing", "Three Coins In The Fountain", "Tell Me Why", "Stranger In Paradise", "Dream", "Perfidia" and "Heart Of My Heart". Live audiences ask much more from performers than hit records. They want an evening of entertainment and The Four Aces deliver with their unique harmonizing, musicianship and subtle brand of humour. The Four Aces are more than singers, they are professional entertainers. They are recognized as one of the most popular singing groups of all time and continue to being back many wonderful memories to their audiences.